As a personal stylist, mommy and wife, I'm rarely in a clothing store by myself. Last Sunday, I treated myself to a trip to my favorite store, stoked about getting some new dresses for Spring. My eyes caught a fantastic little black dress that I LOVED, but when I browsed the sizes, I wasn't sure what my size was. Now, you might be thinking, "Why would a stylist, who is in stores all the time, not know her size?" Here is the deal: It's precisely because I'm always in stores and working with women in (countless) dressing rooms that I have realized it's necessary to try on a lot of different sizes. Sizing is completely different depending on the store and the designer. Let's repeat that for a little more oomph: Sizing is completely different depending on the store and the designer. I mean it! No one can ever just be a Size 8 everywhere they go. A Size 8 in one store is a Size 6 in another. High-end designers usually size down, so a woman with a 27'' waist would be a Size 8, while that same tiny waist would be a 0 in a less high-end store. There is also something called "vanity sizing" that adds to this ever-changing number on the tag. 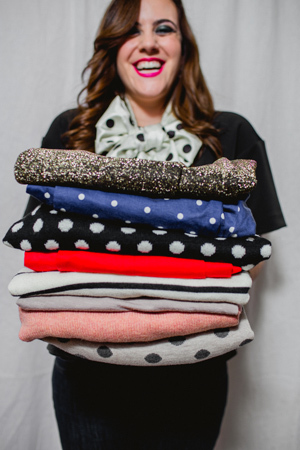 Clothing sizes are not standardized in the United States, therefore stores are free to choose the size that they want, based on what they think will make their client feel the best. Why are we so attached to that little number? When I am shopping with a client, it's always a goal of mine to make them see that going a size up (if that's what the garment calls for) will not only make them look thinner and feel more comfortable, but also that it doesn't necessarily mean their body has changed at all. Whatever size you are in any particular piece of clothing, that's the size you are in that one store ONLY. Let's let this soak in and realize that if we are a bigger size in one store, that it does mean ANYTHING about us. Instead, it's about reframing our outlook. If you go into a dressing room with the mentality that you might need to go a size up or down, instead of saying "I'm a size 6," your shopping experience will be much more pleasurable. Another reason we may have to change sizes is depending on the 'wear' of the item. For example, some jeans have a lot of stretch in them. If you've ever bought a pair of legging jeans, you'll notice that after a few wears, they usually stretch. Since I know this fact, I tend to buy them a little snug, knowing they will conform and stretch pretty quickly. I want you to know that even if your body has changed, that doesn't mean anything negative about you. We are so used to bashing ourselves when we try on a piece of clothing that isn't the size we've decided we are in our head. I want you to try to remember the next time you are in the dressing room that going a size up literally means nothing about your body, and everything about a decision the store made. You are beautiful and a number on a tag shouldn't change how you feel about yourself. Try not to take it to heart and don't read into it. Trust that you are where you need to be, and if an item of clothes doesn't look good on you, or you need to change sizes that only good can come from it. Oh, and just in case we've forgotten, here is a little reminder: No one sees that insignificant tag but you. For more from Melanie, head to her blog headoverheelswithmelanie.com.